Why Is my AC Condensing Unit Not Running? Why Do Air Handlers Freeze Up in Central AC Units? Heat pumps are heating and cooling devices that work similarly to an air conditioning unit. However, heat pumps can pull double duty because they can also heat air that is pulled through the unit. 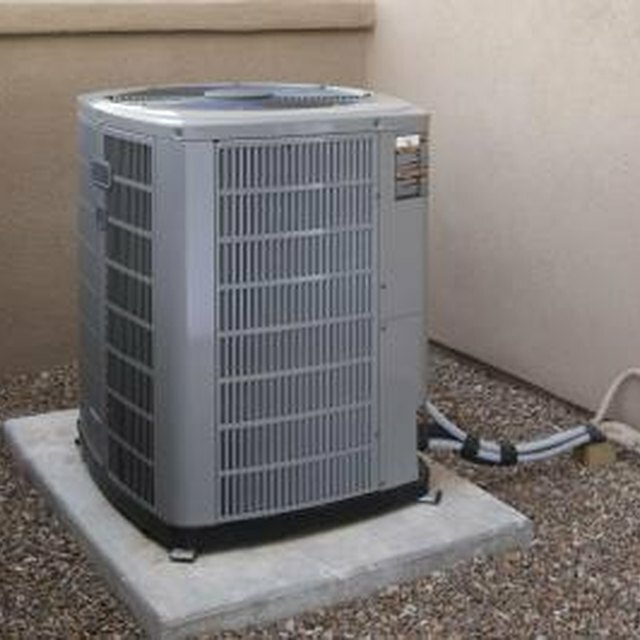 These units are most common in areas that require only mild heating or cooling, so unusually hot weather can cause a variety of problems in a heat pump. Heat pumps feature a backup heat unit, usually a gas or electric heating element, to add extra heat when temperatures drop too low for the unit to pull heat from the outdoor air, states Inspectapedia. In hot weather, a malfunction may cause the backup heat unit to switch on and blow heat into your home. A thermostat set to backup heat mode can cause this problem, but so can a broken compressor. The compressor uses refrigerants to cool air. If this part breaks, many units switch to backup heat automatically and require repairs to work properly again. A problem with the air handler or blower unit prevents any cool air being produced in the heat pump from being distributed around the ducts and vents of your home. One common cause of [an air handler](https://homesteadycom/air-handler-7217312html) struggling to move air is an obstruction of the vents through which the unit draws air. Leaves, tall or cut grass and other debris can build up around the vents of a heat pump or its air handler. Without proper ventilation, the handler or blower overheats and requires a manual reset, or it may trip a circuit breaker. Air filters in all heating and cooling units must be cleaned or replaced regularly, or they can cause a variety of problems. A clogged air filter may cause your heat pump to cycle on and off rapidly due to overheating, notes HomeTips. The air filter on the outdoor unit allows circulation around the motors and other moving parts. Without this circulation, the heat pump quickly overheats in hot weather and shuts off automatically. When it cools enough, it restarts the cycle again. It may seem strange for frost to accumulate in a heat pump during hot weather, but if the refrigerant levels are too low or too high this may happen, according to HVAC For Beginners. When units have to work harder to produce cool air due to a dirty air filter or refrigerant leak, the temperature around the condensing coils that cool the air can drop very low. Coupled with the condensation that a humid summer brings, ice or frost can develop on these lines even on a hot day. A iced-up heat pump must be defrosted before it can provide cool air again. What Causes a Thermostat to Go Bad in a Water Heater?